Emily Nelson and Graham Evans set out to bring a little magic to people’s lives. But they weren’t prepared for the sense of wonder they inspired in one Midwestern woman. 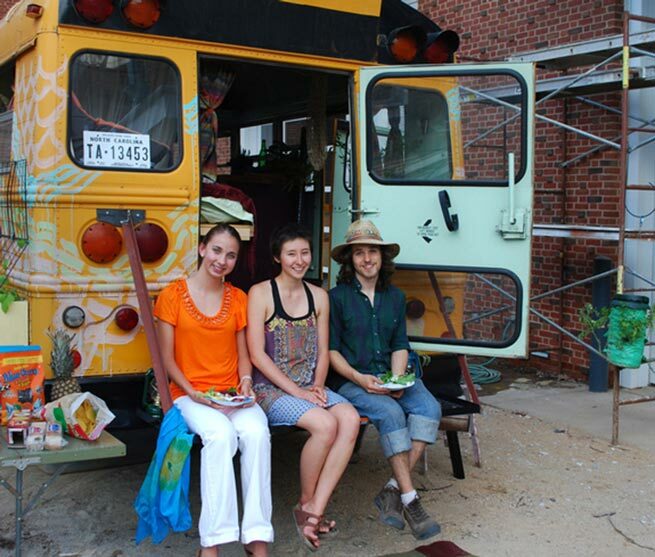 Nelson (Col ’10) and Evans (Col ’09) left Charlottesville in late July on a month-long relational art project to express art by talking with people about food, how it’s grown and sustainable farming practices. 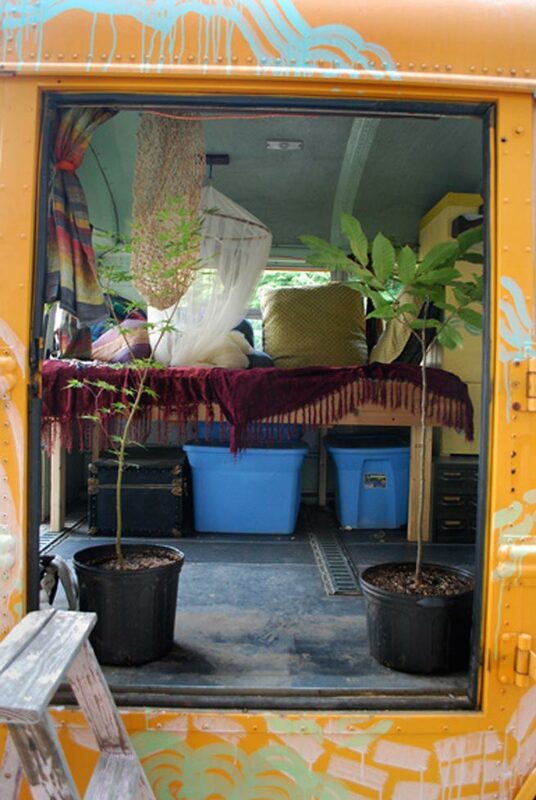 Home was a 14-passenger bus powered by recycled vegetable oil and fitted with a propane stove, sink, bookshelves, bed and filing cabinet laden with seeds they planned to give away. 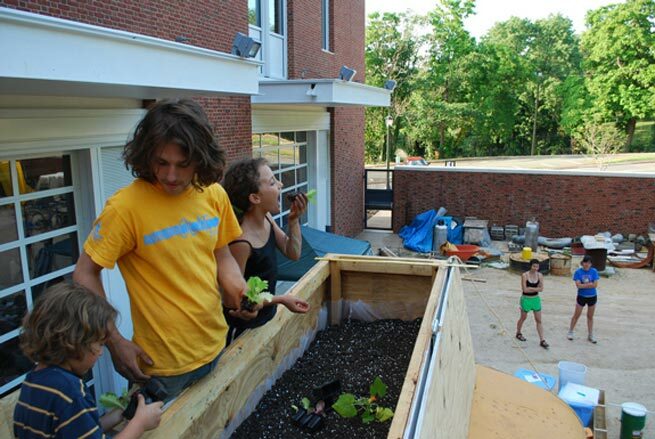 Their project—Nourish(meant)—also was fueled by a UVA undergraduate arts award grant as well as donations from family, friends and supporters. 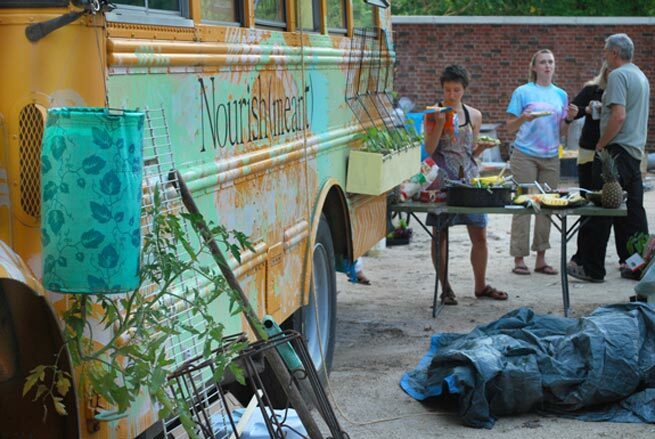 Nourish(meant) from UVA Magazine on Vimeo. Their vehicle looked decidedly Woodstockian. Swirls of color, hand-painted by children, covered the sides, and the roof sported a garden in a custom-built planter box. 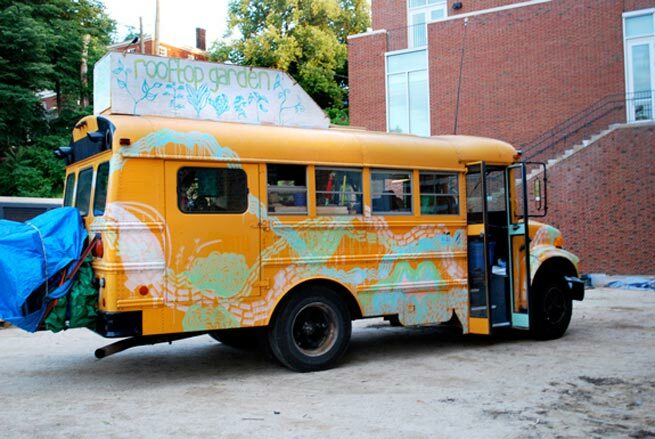 The “magical mystery bus” feeling caught the attention of a middle-age woman working at a highway rest stop in Michigan. 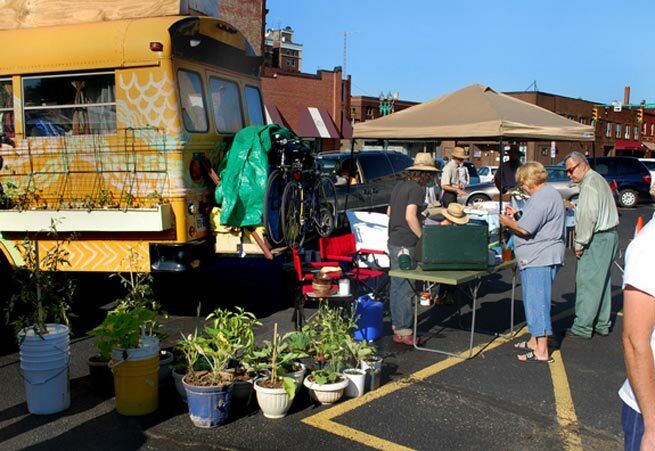 She asked about the project, and though Nelson and Evans were exhausted from traveling and pumping gallons of stinky recycled vegetable oil, they answered her questions. That moment was an emotional high point on a tour that looped through West Virginia, Ohio, Michigan, Wisconsin, Illinois and Indiana. 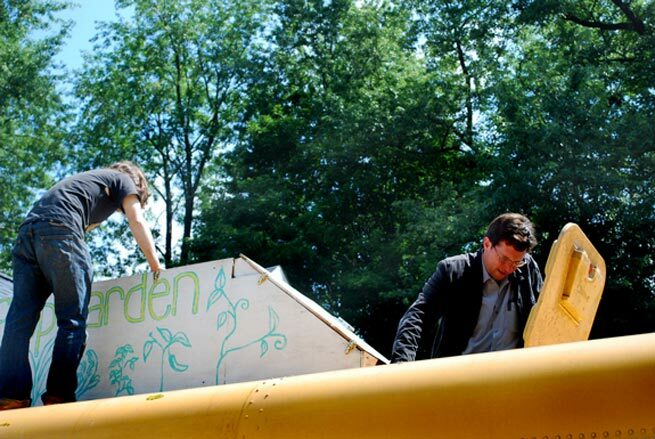 The pair raised eyebrows and consciousness with their seed bank, the bus’s bio-fuel engine, the onboard water recycling system and the bounty of vegetables they grew in buckets, pots and, of course, on the roof. The idea for the project sprouted from Nelson’s experience in Spain with street artists who transformed walls and building facades into lively murals. “That changed my whole perception of art, art in the world and in people’s lives,” Nelson says. 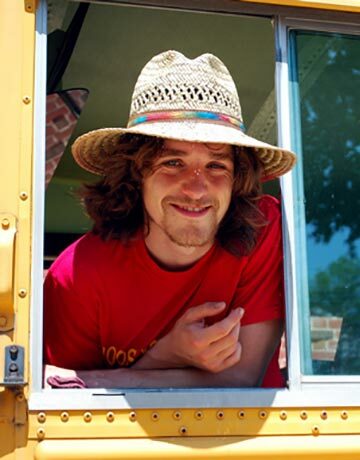 Though Evans is now in Alaska helping relatives with a smoked salmon business, he plans to rejoin Nelson to drive the Nourish(meant) bus to Grand Rapids, Mich., for ArtPrize, an arts competition with a $250,000 first prize. 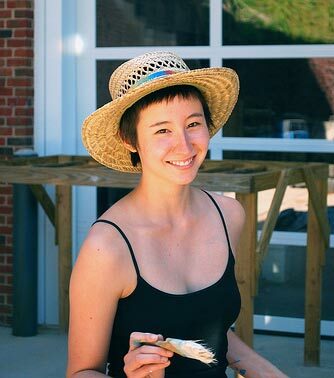 Nelson, a distinguished major in the arts, also plans to use the project in her senior show, and the bus will tour Charlottesville-area neighborhoods. Nelson is toning down the Sixties look, however.